When I first joined Ancestry.com about five years ago and started looking at the family trees out there, I was dumbfounded by the number of people with the surname that I assumed was pronounced ‘Lanoo.’ Countless women in so many different trees were named LNU. Fortunately, I learned there was not a rash of poorly surnamed individuals out there. LNU is a fairly common genealogical acronym meaning ‘Last Name Unknown.” You will most commonly see it with female ancestors, whose maiden names are more difficult to discern the farther back in history you search. I have dozens of individuals in my database with unknown last names. This weekend’s Saturday Night Genealogical Fun at Geneamusings.com (one of the BEST genealogy blogs) asked how many Sarah LNU’s are in your database and how many of those were your ancestors. Well, I searched high and low in mine and of 1400+ people I’ve researched, I have exactly one. 1) Sarah LNU (Abt 1825 – ? 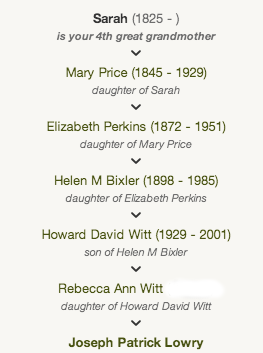 ), who married William Price (1823 – 1895) in Wales. They migrated to Mahoning County, Ohio and had at least 5 children. I’ve not done a lot of research with this line. I did a few quick searches for Sarah to see what else I can find and turned up the 1860 Census, which identified several additional children. Certainly I need to look a little deeper, but for a quick five minute search, headway has already been made! ← Treasure Chest Thursday – Happy Birthday Dad!